In the time leading up to the big count down, it seems popular social media news sites and blogs are publishing a new “best of 2012 social media fails” each day. While I’m thoroughly enjoying the reminiscent “What were they thinking? !” feelings each post conjures, I’m disappointed with how few offer actual advice to prevent similar disasters in the New Year. Inbound marketers, content creators and social media managers everywhere, take note! I’m sharing 5 lessons I’ve learned from a few of my favorite social media fails of 2012. Eye-tracking technology shows we spend the bulk of our time paying attention to the top part of the screen on any given website. Conveniently, practically every social media site locates its login in the top portion of the screen. (You know, right where our eyeballs could burn a hole if they were superhumanly outfitted with lasers.) Yet that didn’t stop many a social media manager from boneheadedly posting personal opinions from brand accounts. 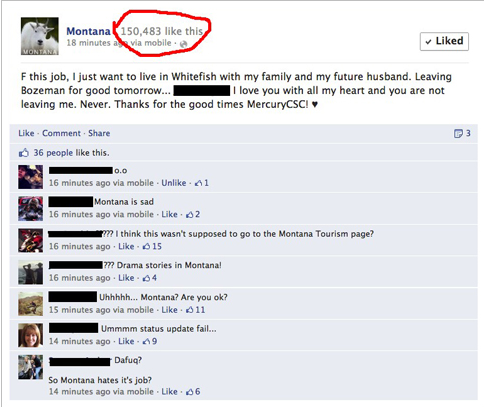 StubHub, Chrysler, KitchenAid and even the Montana Office of Tourism fell victim to social media managers who didn’t ensure they were on personal accounts before sending. The hashtag is probably the most misused tool in social media. There have been instances where I’ve caught myself physically cringing when I see 20+ hashtags in 140-character tweets or, worse, hashtags on Facebook. To my knowledge, big brand social media managers didn’t blatantly abuse the hashtag in either of these fashions in 2012, but many still ended up with egg on their face. McDonald’s and Starbucks are two that failed to research public brand opinion before running hashtag campaigns; CelebBoutique and, most recently, Kmart senselessly pounced on breaking news trending hashtags; and (my favorite) Susan Boyle’s PR team overestimated Twitter users’ maturity when it used the hashtag #susanalbumparty to promote the singer’s upcoming soiree. Lady Gaga, Justin Bieber, Katy Perry and Rihanna top the charts as Twitter’s most followed users with many more celebrities comprising the Top 100. While Twitter can be a great tool for celebrities to quickly and efficiently engage with fans, some should seriously think hard before cranking out their every waking thought. Among those are summer Olympians Voula Papachristou and Michel Morganella who sent racist tweets leading up to and in the first weeks of the 2012 London Olympics, Donald Trump who called the electoral college “phoney” and declared Barack Obama’s reelection was a “disgusting injustice” and Lindsay Lohan who told Twitter users to “Stop projecting negativity” as Hurricane Sandy ravaged the East Coast. If 2012 showed us anything, it’s that a few social media higher-ups need to take a chill pill and ask for a second opinion (or hire a team who won’t blindly follow without asking questions) before launching campaign tactics. Take Chick-fil-A for example: Social media users and the media slammed the restaurant for allegedly creating a fake Facebook profile of a teenage girl who defended the company in comment chain during a series of PR nightmares following anti-gay marriage comments from CEO Dan Cathy. 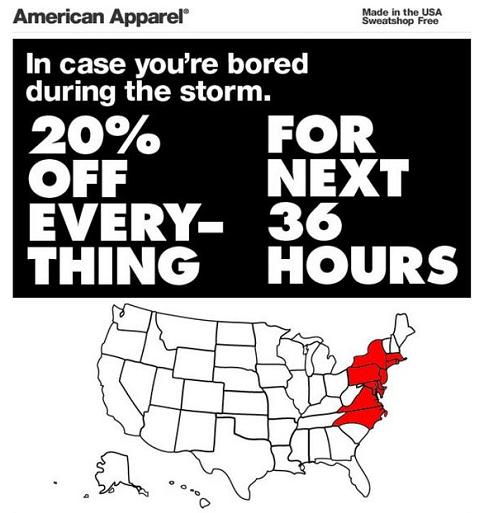 Then there was American Apparel’s “In case you’re bored during the storm” sale for customers in states affected by Hurricane Sandy. Toyota and the Swedish tourist board are two others that could’ve benefited from a bit more thoughtfulness before campaign launches. What were a few lessons you learned from 2012’s best social media fails? Share your insight and site the fail in the comment section! Lisa Gulasy is a young public relations professional highly interested in social media brand management, copywriting and grammar. Lisa works as an Associate Consultant at Kuno Creative where she creates content and assists senior consultants. Find her on Twitterand LinkedIn.